Indocyanine Green angiography involves photographing the retina with special filters after injection of a tracer dye intravenously. 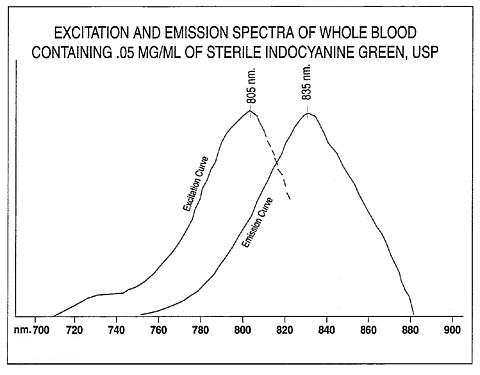 What is Indocyanine Green (ICG) Angiography? 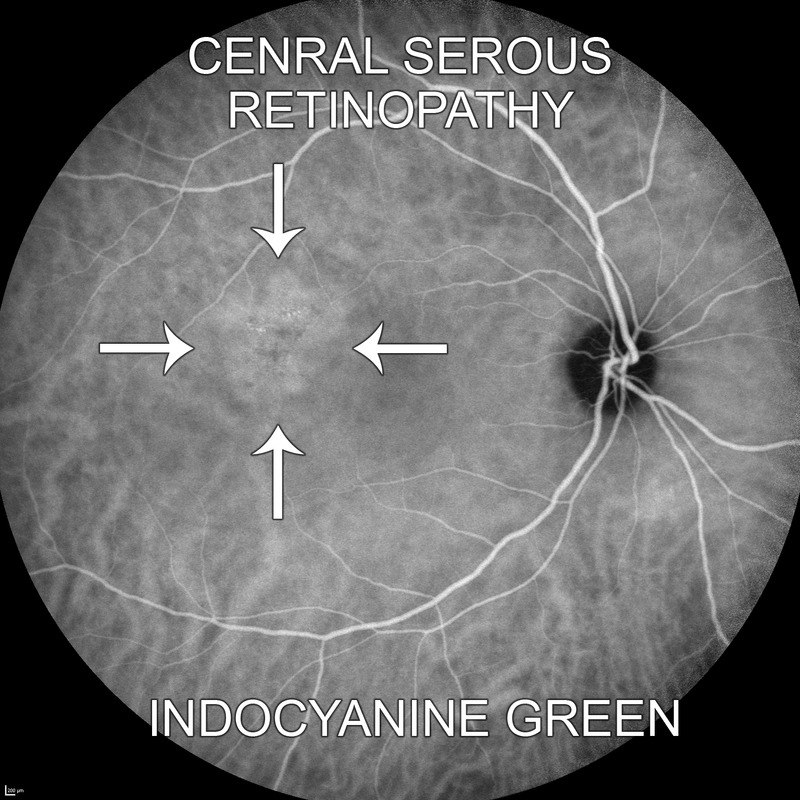 Indocyanine Green angiography is an eye test that uses a special dye and camera to look at blood flow through the retinal vessels. ICG does not leak from normal retinal or from normal choroidal vessels. Fluorescein dye leaks from normal choroidal vessels but ICG dye does not. That is why it is sometimes used in conjunction with fluorescein to evaluate and manage disease of the choroid and retinal pigment epithelium. The test is usually performed with a dilated pupil. After the dye is injected in a vein, a photograph is taken using infra-red light which is absorbed by the ICG molecules. The molecules fluoresce and emit light with a longer wavelength. A barrier filter blocks any reflected light so that the images capture only light emitted from the ICG. Images are acquired immediately after injection and continue for ten minutes depending on the pathology being imaged. What is a normal ICG angiogram? It is helpful to look at a normal example of an angiogram to understand the abnormal examples listed below. The normal image accompanying this text shows the vessels as white. You can see two sets of vessels on the image. The superficial retinal vessels are labelled with an arrow. The deeper network of choroidal vessels is not labelled. The choroidal vessels are much more abundant. 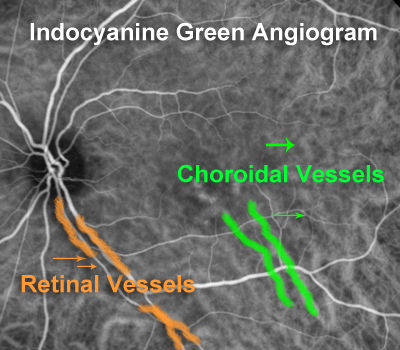 The fluorescein angiogram does not show choroidal vessels for two reasons. The main one is that the wavelength of the light emitted from fluorescein is blocked by the overlying retinal pigment epithelium. Therefore only the retinal vessels are seen which are superficial to the retinal pigment epithelium. The underlying choroidal vessels are not seen. Secondly, the ICG dye does not leak from the intact choroidal capillaries so the vessles remain visible. The fluorescein dye does leak from intact choroidal capillaries and that leakage also obscures individual choroidal vessels. What is a subretinal neovascular membrane? For unknown reasons, sometimes a blood vessel network will grow in patients with macular disease. This image shows a SRNVM starting at the edge of an old histoplasmosis scar. When an SRNVM is close to the center of the vision, it can cause symptoms of distortion and vision loss. When it is directly below the central vision, it can cause central vision loss. The accompanying image is from an indocyanine green angiogram and nicely shows the network of abnormal blood vessels that have grown from the old scar. This patient has had vision loss for about 2 weeks. There was a fresh bleed that probably caused the sudden onset of symptoms. The blood vessel growth, if untreated, usually evolves into a scar and damages the overlying retina causing permanent vision loss. If the blood vessels are treated early, the growth and transformation to a scar can be prevented and vision loss averted. 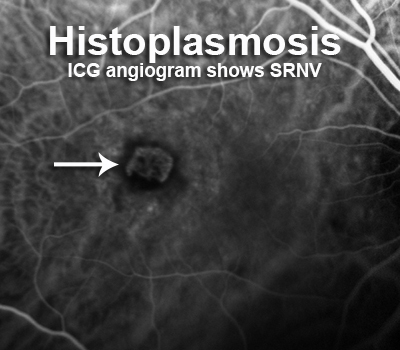 When the choroidal vessels leak, it can be seen as a white patch in the late frames of an ICG angiogram. One classic disease that causes the choroidal capillaries to leak more than they should is central serous retinopathy. The ICG of a patient with active CSR is shown along with this text.